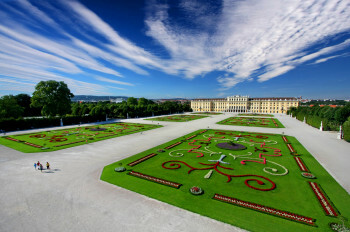 Schönbrunn Palace is among the 15 best rated Tourist Attractions in Austria. © Schloß Schönbrunn Kultur- und Betriebsges.m.b.H. / Julius Silver Enjoy the Great Parterre at a tour through the park. Schönbrunn Palace is a former imperial summer residence located in Vienna in Austria. 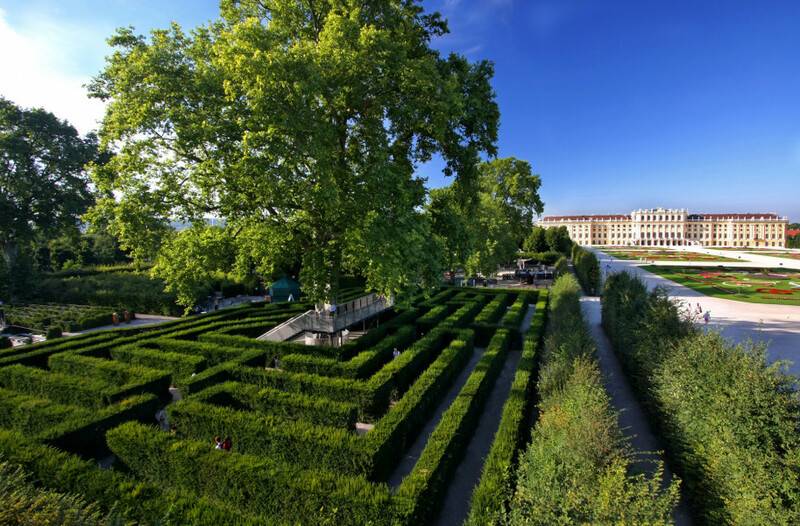 Since the mid-1950s Schönbrunn has been a major tourist attraction and is consideredone of the most important cultural and historical monuments in the country. The tour of the palace begins at the Blue Staircase and it includes a visit to the imperial apartments and the magnificent state rooms. 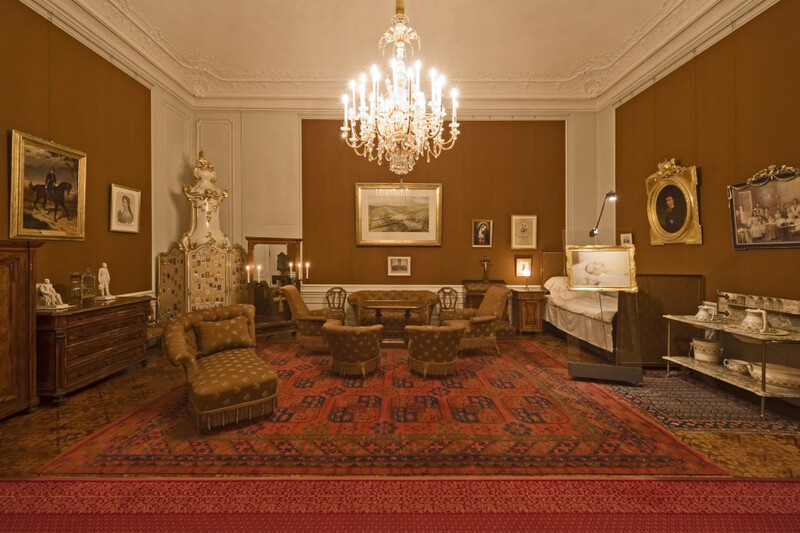 The tour includes the residential suite occupied by Emperor Franz Joseph and his wife Elisabeth in the west wing, the state rooms in the central section of the palace, the imperial apartments of Maria Theresa and Franz I Stephan, and the Franz Karl Apartment, which was occupied by Franz Joseph’s parents, Archduchess Sophie and Archduke Franz Karl. Another highlight of the Schönbrunn terrain is the park at Schönbrunn Palace, which was opened to public in 1779. Together with the Palace itself, it was placed on the list of the UNESCO World Heritage Sites in 1996. The park offers numerous attractions and places worth-seeing, such as the Privy Garden, the Orangery Garden, the Maze, the Palm House, the Desert House and the Zoo. 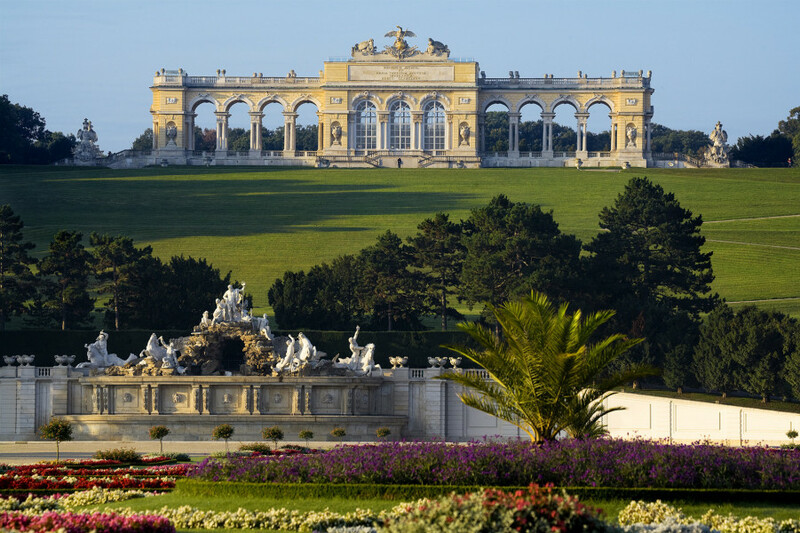 Schönbrunn or simply Vienna Zoo was founded in 1752 and is thus the oldest continuously operating zoo in the world. Moreover, it is one of only a few zoos worldwide to host giant pandas. © Schloß Schönbrunn Kultur- und Betriebsges.m.b.H. 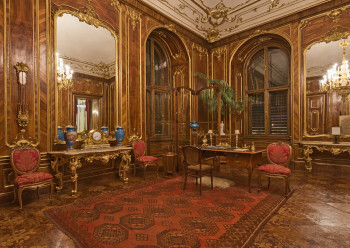 / Alexander Eugen Koller The Walnut Room was furnished with wooden panelling and served as an audience room. 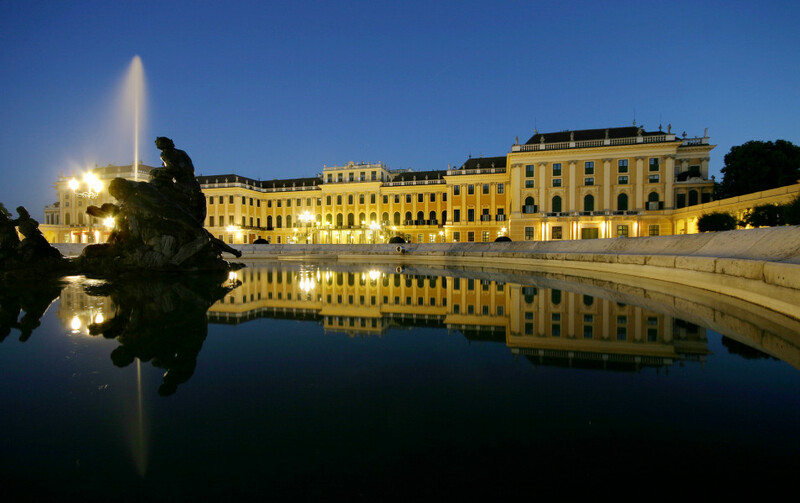 The history of Schönbrunn and all predecessor buildings dates back to the 14th century. In 1569, the area came into Habsburg possession through Maximilian II. 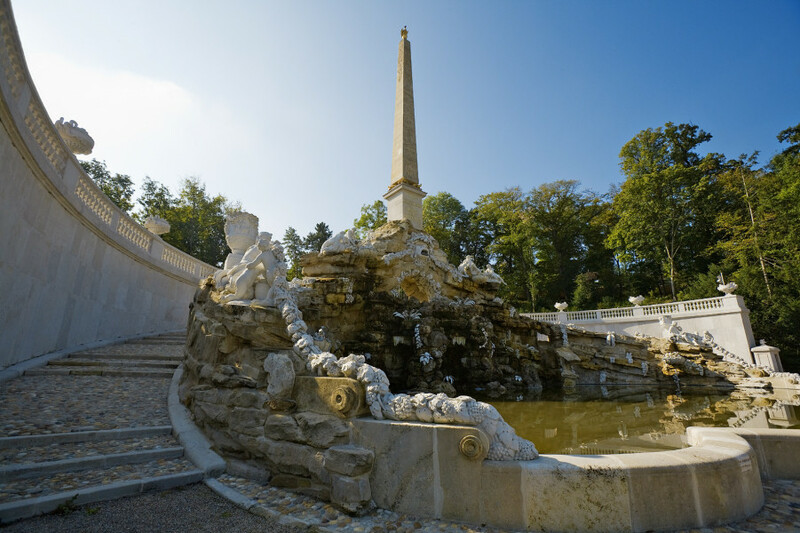 Legend has it that it was Emperor Matthias, who discovered a fountain, which gave the estate the name it bears today. 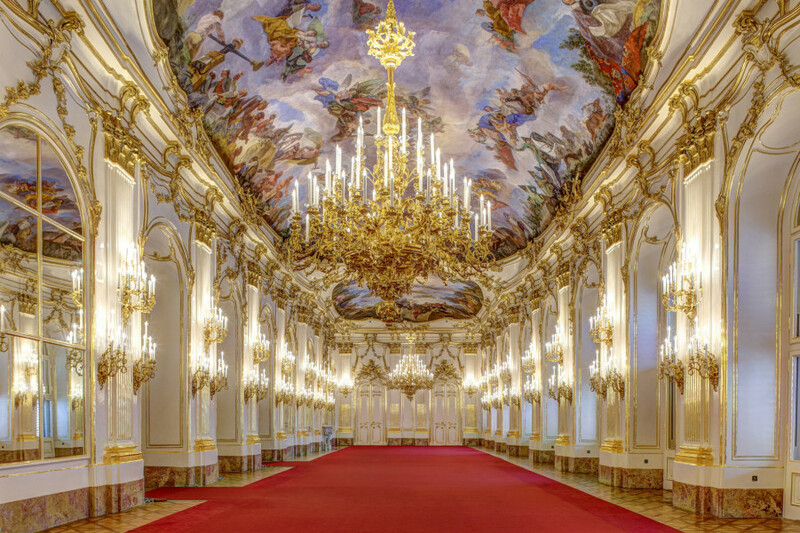 At the end of the 17th century, Emperor Leopold I commissioned the Baroque architect Johann Bernhard Fischer von Erlach to design an imperial hunting lodge for his son, Crown Prince Joseph, who was later to become Emperor Joseph I. Schönbrunn was to grow into a palatial imperial residence over the course of the 18th century. © Schloß Schönbrunn Kultur- und Betriebsges.m.b.H. / Julius Silver Schönbrunn Palace at night. 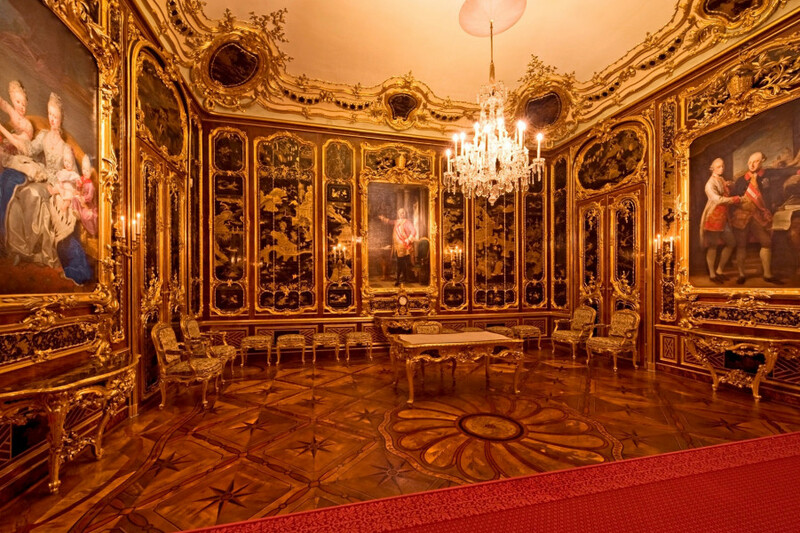 Coming from Vienna International Airport, take the A4 motorway heading towards Vienna, then continue on the southbound A23 (follow signs for Graz), then take the Altmannsdorf exit and follow the signs for Schloss Schönbrunn. Arriving on the A2 motorway, follow the signs for the city centre, take the Altmannsdorf exit and follow the signs for Schloss Schönbrunn. Arriving on the A1 motorway, follow the signs for the city centre which will take you directly to Schönbrunner Schlossstrasse 47. From the Westbahnhof (western railway terminal), take the westbound tram line No. 58 and hop off at Schönbrunn. From the Station Meidling, take the northbound U6 (brown) underground line and get off at Längenfeldgasse, then change to the westbound U4 (green) underground line to Schönbrunn. From Vienna Central Station, take the U1 (red) underground line to Karlsplatz, then change to the westbound U4 (green) underground line to Schönbrunn.